Raw beauty at it’s finest. 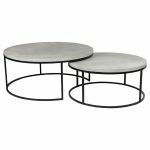 The Madura Nest coffee tables are a beautiful expression of material and form. Iron and raw concrete combine to create modern luxury that is perfect for your living room.